It’s hard to believe that just a few years ago, we were still pondering who the future stars of the heavyweight division were going to be. For years upon years, boxing fans had become accustomed to seeing the two Ukraine giants, fighting brothers Vitalii and Wladimir Klitschko, ruling over the division. And while there is no denying the formidable way in which each Klitschko ran their career, people began wondering if we would ever again see a new star, a new face to carry the sport. One of those men, Anthony Joshua, has arrived. The reigning WBA/IBF heavyweight world champion, Joshua possesses many traits that have made him a crossover superstar in the sport of boxing. At just 28 years of age and possessing a 20-0 record with 20 knockouts, as well as the physique of a bodybuilder, Joshua has crossed over to a superstar status in 2017. With so much talk going on with Joshua, we decided to take a look at his best opponents to date. Joshua defeated Klitschko inside of Wembley Stadium in April of this year. In a wild and high-pitched battle, Joshua got off to a strong start and even rocked Klitschko and dropped him in the fifth round. One round later, Joshua himself was dropped, as the makings of a classic fight were on display. Joshua ended up rallying and stopping Klitschko in the 11th round for his greatest victory to date. Klitschko, 41, likely is heading to retirement, and carrying with him his 64-3 record with 53 knockouts, and years and years of successful title defenses. It was December of 2015 when Joshua and White met inside of the O2 Arena, as both men were undefeated prospects at the time, each residing in the UK. Joshua went on to stop White in the seventh round after a wicked uppercut had him in trouble. But White is no slouch, as he has reeled off six straight victories, including wins over Robert Helenius, Dereck Chisora, and David Allen, while setting himself up to get back into the big picture. Breazeale is a big, rugged American heavyweight who traveled overseas with high hopes of upsetting Joshua at the time. Breazeale was stopped in the seventh round by Joshua last summer, yet it didn’t mark the end of his career at all. Breazeale has bounced back with a pair of victories, including most recently stopping journeyman contender Eric Molina after the eighth round inside of the Barclays Center on Nov. 4 on the undercard of Deontay Wilder’s viscous first-round knockout over Bermane Stiverne in their rematch. Joshua’s last performance saw him stop the very formidable Carlos Takam on Oct. 28 inside of the Principality Stadium in Cardiff. 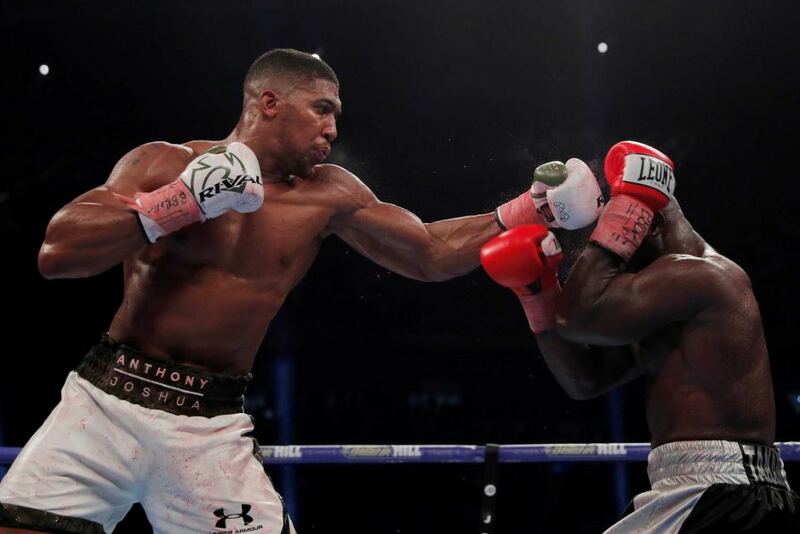 Takam is one of the most durable heavyweights in the sport and Joshua predicted that it was going to take him until the 10th to score the victory. Needless to say, Joshua’s resume is only going to grow from here on out. At the moment, people are clamoring for a huge showdown with WBC champion Deontay Wilder and here’s hoping it comes off.